Posted on August 14, 2015 October 11, 2018 by Marty Schoenleber, Jr. Recently I read a post from the Gospel Coalition that encouraged Christians to stop reading Bible verses. It was titled, “The Single Most Practical Advice for Christians? Never Read a Bible Verse” and was itself an excerpt from a longer article from the website STAND TO REASON by Greg Koukl. It was a great article and one in which I am in complete agreement. The article’s title was . . . The article title sounds shocking but it has a serious and powerful warning. So many verses in so many situations are quoted out of context and given “a meaning” that they never had, to suit the interpreters point or the need of the moment. We have probably all done it at times. But it is never good no matter how “helpful” we might find it to be in the moment. It is an abuse of the Scripture. It is using the Scripture for a purpose for which the Spirit of God never intended. To put it simply, a text can never mean what it never meant. A text can never mean what the Spirit did not intend. So Greg Koukl is right. Never read a Bible verse. Always read at least a paragraph. Always read its context to make sure that you have understood the text and apply it properly to your own situation. Recently, I saw a short video by a popular younger preacher that unfortunately was a good (sic) example of bad interpretation and a misuse of the Bible. I like Craig Groeschel. He’s a great communicator, a charismatic leader, and a passionate follower of Christ. He also has a great sense of humor and is a creative and visionary thinker. But in a recent video taped behind the scenes at a recent Willow Creek Leadership Summit, Craig misapplied a text that is maybe one of the most abused texts in the New Testament. So far no problem. Craig is being honest about what he does well and what he does not do so well and his wife is being wonderfully supportive and positive and encouraging to him about the kind of capabilities she sees in him as a person. From there Craig begins to talk about becoming a person who says more positive things and becomes more like the things he is confessing. I’m going to believe the best here and assume that Craig is not talking about the theologically suspect “positive confession” movement that turns God and good things happening into a magic genie. I agree. Especially if the changes are needed for what God calls the leader to do. That caveat, “everything God calls me to do” is a good one. 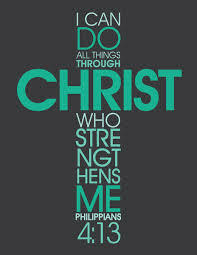 But let’s get back to Philippians 4:13. 10 I rejoiced in the Lord greatly that now at length you have revived your concern for me. You were indeed concerned for me, but you had no opportunity. 11 Not that I am speaking of being in need, for I have learned in whatever situation I am to be content. 12 I know how to be brought low, and I know how to abound. In any and every circumstance, I have learned the secret of facing plenty and hunger, abundance and need. 13 I can do all things through him who strengthens me. 14 Yet it was kind of you to share my trouble. In that context, “abundance and need”, he writes verse 13, “I can do all things through Him who strengthens me.” This is not a verse to hog tie to any desire or deficiency we have but a verse to remind us that Jesus is enough, whether we are rich or poor, whether we have much or little. Christ strengthens us in our service of Him and the kingdom and reminds us that He is enough for every situation. This is not a verse for a 140 lb. college student to claim, “I want to be an NFL linebacker and the Bible says I can do all things through Christ.” Nor is a verse for a man or woman to claim as the foundation for developing gifts that God has never given them. Be careful with the Scripture. And be careful of preachers, including me, who periodically don’t do all the homework we should and apply the Scripture in ways that it was never intended to be applied. Thanks for the heads up on the title. Mistakes of writing quickly. He who is not with Me is against Me, and he who does not gather with Me scatters abroad. Now John answered Him, saying, “Teacher, we saw someone who does not follow us casting out demons in Your name, and we forbade him because he does not follow us.”  But Jesus said, “Do not forbid him, for no one who works a miracle in My name can soon afterward speak evil of Me. For he who is not against us is on our side. For whoever gives you a cup of water to drink in My name, because you belong to Christ, assuredly, I say to you, he will by no means lose his reward. Then he went up from there to Bethel; and as he was going up the road, some youths came from the city and mocked him, and said to him, “Go up, you baldhead! Go up, you baldhead!”  So he turned around and looked at them, and pronounced a curse on them in the name of the LORD. And two female bears came out of the woods and mauled forty-two of the youths. I’m sorry but I neither get your point nor understand why you object to my post. It was kind, positive and respectful of Craig as a man, as a communicator, as a leader, and as a pastor. It affirmed his wife in her respect and love for her husband and it acknowledged his positive responsiveness to her counsel. And we would part as friends. He is a good man and I praise God for his ministry. Now, on Elijah being a man of God. Elisha was a man of God, which is to say that he loved and served God. It is not to say that he made no mistakes. He is, after all, like Craig and myself, just a man.